AEHCOS donates 0.7 % of its annual budget to social programs. The Asociación de Empresarios Hoteleros de la Costa del Sol (AEHCOS), donates 0.7 % of its budget to the BIBERÓDROMO association. For another year, AEHCOS has donated more than 0.7 % of its annual budget to social programs. In this case, the donation has been given to the Malaga based BIBERÓDROMO association, which provides food to over 200 children between 0 and 24 months old in Malaga. The agreement was signed between the president of AEHCOS, D. Jose Carlos Escribano de Garaizabal, the vice president of Malaga, Francisco Moro, the president of the Biberódromo association, D. Manuel Montes Cleries and the Counsellor of Tourism in Malaga, D. Julio Andrade. AEHCOS continues to reinforce their social action within the province of Malaga and demonstrate its cooperative manner, which is so necessary at this time. Biberoóromo is a welfare organisation that is responsible for providing basic resources and paediatric first aid to children from 0 to 24 months old to families in need and at risk of exclusion. It also attempts to improve the cultural, family and professional situation of their mothers. Their donations include supplies such as formula for newborns, formula, fresh milk, yoghurt and other dairy products, baby food, biscuits and cereals, amongst other foods. They also provide diapers in the sizes needed, and sometimes, clothing and toys. In order to do so, they depend on donations from partners, banks, the local government, businesses and various groups and individuals that are motivated by their pledge. For this purpose, our Association has allocated 0.7 % of its budget to business projects that allow for the development of necessary areas, and at this time has reinvested the amount recovered from financing previous projects. -Expanding a fish sales store. This business received funds in 2012 when it began its activity. It hopes to expand its small business by creating a new full time job position in order to better attend to the ever growing demand for fish. -Purchasing school supplies like 12 new computers, school chairs and desks, 1 power generator and batteries, so that students who live in remote areas can receive an education with public funding. -Help with increasing the production of peanuts. Doing so will increase the ability of farmers in this line of production because this seed is a product that does very well in this area. Farmers will then be able to increase their plantation areas. AEHCOS focuses on transferring CSR to all of our businesses. “AEHCOS Responsable” was present in the workshops given by La Confederación de Empresarios de Málaga on last 24 October about how to develop social responsibility in SME. In Spain, there are over 3 million businesses, of which 99.98 % are SME. In Malaga, it is 99.95 %. A dormant idea: the future of CSR is in SME. There are currently many businesses that manage their businesses with the support of CSR criteria and they are more and more conscious that sustainable businesses nowadays are those who take on responsible behaviour related to the environment as well as their social or economic environment. In conclusion, steps like reducing the consumption of water or light, recycling or taking steps to reconcile work and family life are free in many cases and boost sustainable growth of many businesses. Step by step: when we are in the position as a consumer, we are aware that, for example, there are many ecological products for sale. A few years ago, we observed those establishments around us that adopted recycling methods, or we focused more frequently on the packaging of many products that we buy everyday. A few years ago, the most concerning thing was to only offer the best products to our customers. Nowadays, it’s necessary to keep in mind other parameters like the best productivity in the business or searching for new markets. Socially responsible businesses are more productive and more competitive, so their value increases. There are more and more businesses for which CSR is a key action guide and these actions are rewarded. Organisations like the Deputation of Malaga recognises social, economic and environmental compromises of businesses in Malaga. They grant a distinctive award to the businesses that have successfully implemented CSR values. Or the Confederación de Empresarios Malagueños, which this year has given twenty-five memberships for the United Nations Global Compact and diplomas to businesses who participated in the “Sustainable and socially responsible SME’s in Malaga” program. Currently in our sector, the “2012 CSR Hotel Award” has been initiated by Intermundial and Cehat group, which in its first edition, will recognised the effort of hotel managers in initiating Corporate Social Responsibility actions. At AEHCOS, we are responsible with our businesses. In Spain’s competitiveness ranking, it occupied the sixth position in 2009, while in 2011 it has moved to the eighth. How do we distinguish ourselves? : by price, by quality in the service we provide, by our facilities, by the usage of energy efficient methods, and by responsible behaviour. *Using environment friendly paper and recyclable packaging. *Using detergents and cleaning products made with low environmental management systems. *Buying in bulk, avoiding unnecessary portions and packaging. *Using recycled IT material (ink cartridges, toner). *Buying toilet paper that is not made with chlorine or dye. -Choose vegetable oil, glass, paper and cardboard, batteries and organic waste. -Avoid buying products in non-recyclable containers in small or individual portions. -Using chlorine with mineral salt in pools. -Using email at work to save paper. -When managing hazardous waste, do so with authorised handlers. -Using partial flush systems in toilets. -Replacing towels and bed sheets when the guest requests this. -Using drip irrigation or low-pressure sprinkling. -Installing water saving devices in showers and sinks in rooms. -Incorporate what’s called an “Energy Control Figure”, in charge of proposing initiatives to always save the most energy. -Create a Saving Manual for mainly energy and water. -Environmental awareness for hotel personnel, through the so called Saving Committees. The Idea Agency encourages projects for the development of CSR protocols, equality protocols, conciliation or eco-innovation. It means businesses putting an additional % on the profit base, which ranges from 5 % to 20 %. Grants for the implementation of control software of all facilities and programs to adjust facilities with greater efficiency. -Substituting traditional lighting for lower consumption lighting. -Installing automatic lighting system with cards in rooms. -Double glazing on doors and windows. -Automatic system for disconnecting air conditioning when doors and windows open in rooms. -Installing sensor lights in outside areas. The Deputation of Malaga recognises social, economic and environmental compromise in entities of Malaga. An award that distinguishes businesses that have successfully implemented CSR values. Last December, they gave out three prizes. The winning businesses were Fuerte, Ticteck and Asociación Arrabal. The AEHCOS collaboration with Haiti does bring results. It has created a dozen jobs and the technological advancement of a fruit and casabe processing plant, as well as a kerosene stove factory. AEHCOS, in accordance with its philosophy of showing solidarity with non-profit entities and helping sectors in need, has collaborated with the HAITI VIVA Association for the past two years,which has helped with business creation projects and jobs in HAITI. It has given this 0.7 % of its budget. The first project, a fruit and casabe processing plant, created six long term and full time jobs, and currently has returned almost all funds received in the form of loans. Its sales have increased over 25 % in respect to June of last year thanks to new customers in Canada. AEHCOS general assembly decided to give 0.7 of its 2011 budget again to one of the ZAFEN projects, an organisation for economical development in Haiti. It’s now the second consecutive year that the association has collaborated with Haiti Viva. The AEHCOS donation went to the project that supports the increase in the production of kerosene stoves, amongst other objectives, like fighting deforestation in the area. With these contributions, they are able to increase the supply of the store that offers these kerosene stoves. By being able to buy raw materials, they have increased the production of them for new customers. These have been especially demanded by schools who offer hot lunch to students. Additionally, the open workshop initiated by the owner in 2000 teaches and trains a group of young people how to make these stoves. Today, they have already trained over 30 students that work in other parts of the country making stoves. They have created 6 long term positions that have been held by young people in the community. As an additional objective, making these stoves means fighting against deforestation in the area. The stoves that are made are sold at very affordable prices in the community, which increases their sales and the reduction of carbon use which contributes to massive tree cutting. It should be noted that these small loans are returnable. In other words, once the business starts to have benefits, they return the money which is reinvested in another project. The President of AEHCOS, José Carlos Escribano, has signed this agreement in collaboration with the HAITI VIVA representative, Serge Piard. For the Association of Hoteliers of the Costa del Sol, it’s an undeniable compromise. For that reason, they have decided to support the undertaking of micro-entrepreneurs in Haiti so that they can cultivate the sustainability and self-sufficiency in the area. AEHCOS general assembly decided to give 0.7 of its 2010 budget to one of the ZAFEN projects, an organisation for economical development in Haiti. 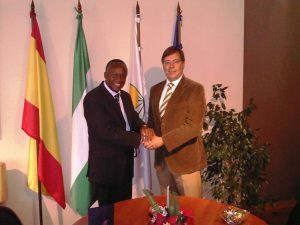 The AEHCOS donation went to the project supports the strengthening of the fruit and casabe processing plant. With this help, they can buy equipment and tools that will improve the production capabilities and efficiency in this production plant. This will create 8 long term, full time jobs. Access the project’s website from here. The non-governmental association Madre Coraje has been working for 10 years on recycling non harmful urban waste that has been retired to arranged establishments. This waste is destined for soap preparation, for humanitarian relief and to be sold for obtaining bio-diesel, which finances delivering it to the Humanitarian Aid, Education for Development and Projects for Development, in Peru and the other countries they work with. b. Clothing, furnishings and all kinds of textiles. c. Toner and ink cartridges. d. Alkaline batteries, batteries and storage batteries. e. Waste from restaurants and cooking services, as well as decorative objects. On its behalf, the Madre Coraje Association provides AEHCOS with talks and exhibitions intended to spread the value of recycling and the need to preserve the environment and sea. Also, it educates workers, customers, and suppliers on how to contribute and participate individually and collectively in support of this. With this agreement, they hope to emphasise consciousness of the environment to improve quality of life of our neighbours and visitors, facilitating and increasing the practice of selecting recycling.